“I don’t like drama.” My girlfriend was denying to like the very movie type I regard as the best. It just couldn’t enter my mind how could someone not like drama. Poetry, music, paintings, photography, all arts inspire a sense of condescension and compassion that are, after all, what captivates us. It is when we partake of the emotions disclosed in the verses of an uncorresponded lover, immersing ourselves in his story as if it were our own, that we truly admire the beauty of his composition. All of art share this characteristic, the attempt to convey emotions. And which works are better than those classified as drama? Which are deeper or bear a greater metaphor for our own reality? 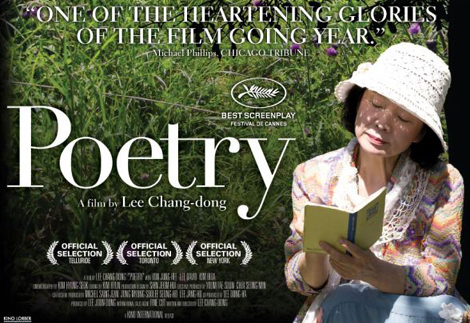 I want to watch a movie called Poetry. It is the story of a lady that discovers she has Alzheimer’s and decides to study poetry as her awareness of the world fades away. How sad that is, and how big of an inspiration to make us see the world around us differently. We have the privilege to remember and to move forward whilst she was doomed to move increasingly and relentlessly backwards. No action movie can invite you so strongly for a review of your pre-assumed concepts. It is a mind-changing experience to have someone else’s tears streaming through your eyes. It is more than entertainment, it is the creation of fellowship in the suffering of a person. “I just don’t like to feel sad.” Absurd! What a preposterous assertion! Sadness is an integrating part of the world, much bigger part for some than for others. Watching a drama we are having the opportunity to get the taste of what the character was going through. And then I stopped. You know, the character probably would rather not to go through the sad situation, then how wrong would it be to not want to take part in something that was wished not to exist? “Oh but we have to be aware of other people’s realities”, you may say. But the tasting of people’s pains is not a requirement for active compassion to come about. Doctors do not need to contract illnesses to be compassionate or willing to help patients. And by all means, drama is still only an entertainment genre, it will entertain the consumer and do nothing to aid those living the dramatic situation shown. In the end I realised, as usual, that the fool was me. She was right to want her mood lifted up and not brought down by her entertainment, After all, the life we all aspire is a painless one. My girlfriend’s remarks made me realise how curious it is that we enjoy being amused by experiencing the very things we avoid. Dale Carnegie said the thing we love to talk about the most is ourselves. Maybe we are attracted by drama because it is in some way talking about us. Maybe it is because we feel identified. Maybe the tears we are crying are not the character’s but our own.